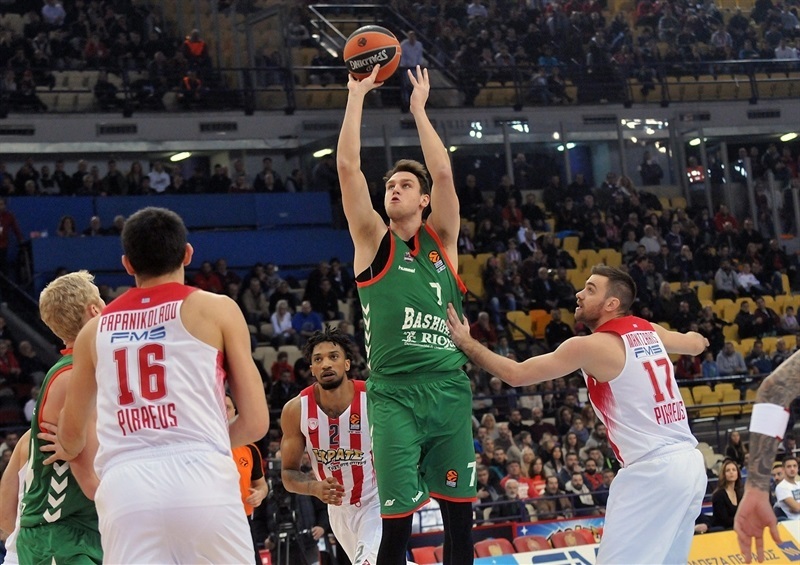 In a battle between teams in the top third of the Turkish Airlines EuroLeague standings, Olympiacos Piraeus recorded its fifth consecutive home win by routing Baskonia Vitoria Gasteiz 92-62 on Friday at Peace & Friendship Stadium. 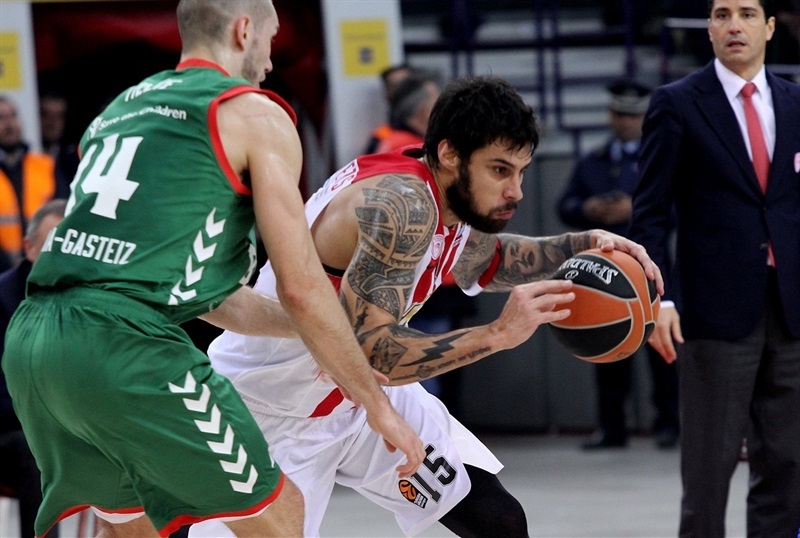 Olympiacos remained one win behind reigning champion CSKA Moscow for first place, while Baskonia dropped to 11-7. 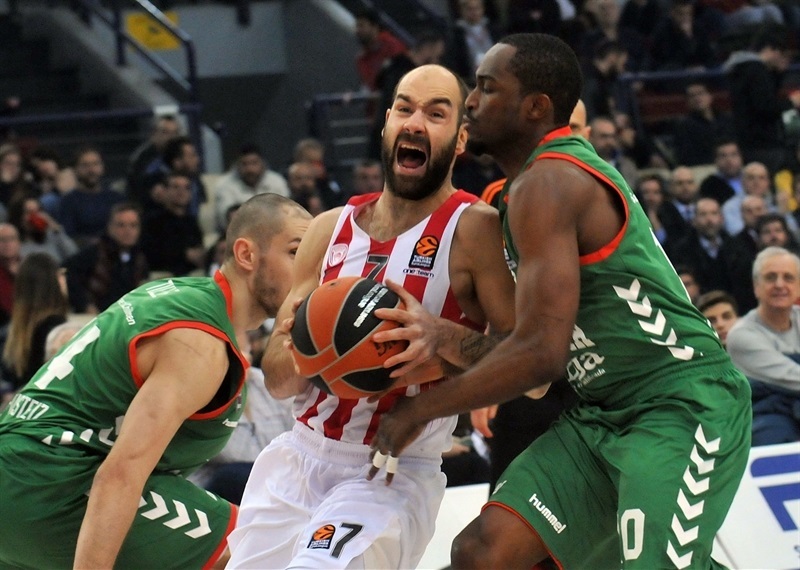 Olympiacos completed a season sweep of Baskonia, which gives it the always-valuable tie-break advantage. 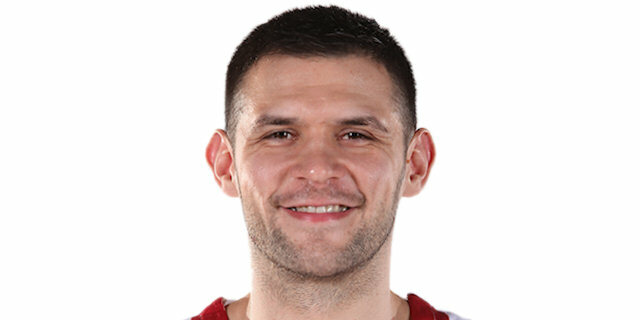 Kostas Papanikolaou, Vassilis Spanoulis and Georgios Printezis led the Reds with 12 points apiece, Erick Green added 11 and Vangelis Mantzaris 10. 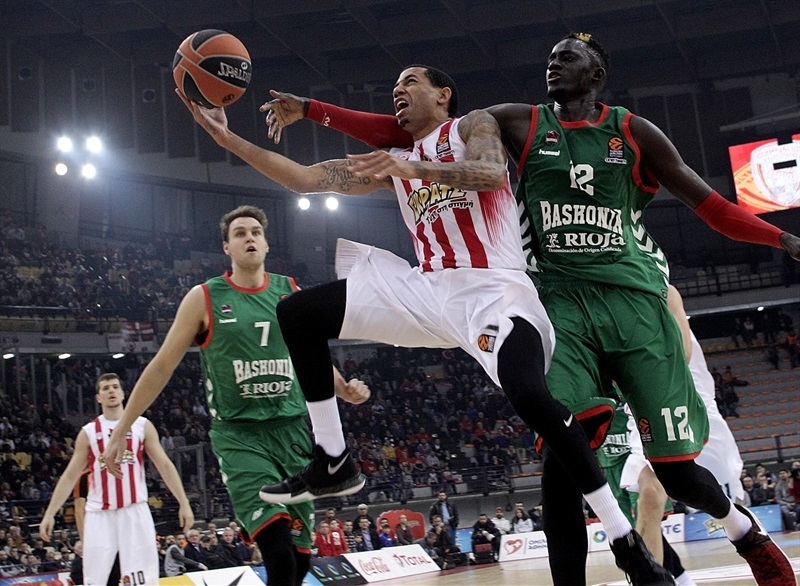 Shane Larkin led Baskonia with 12 points and Adam Hanga posted 11 points and 8 in defeat. 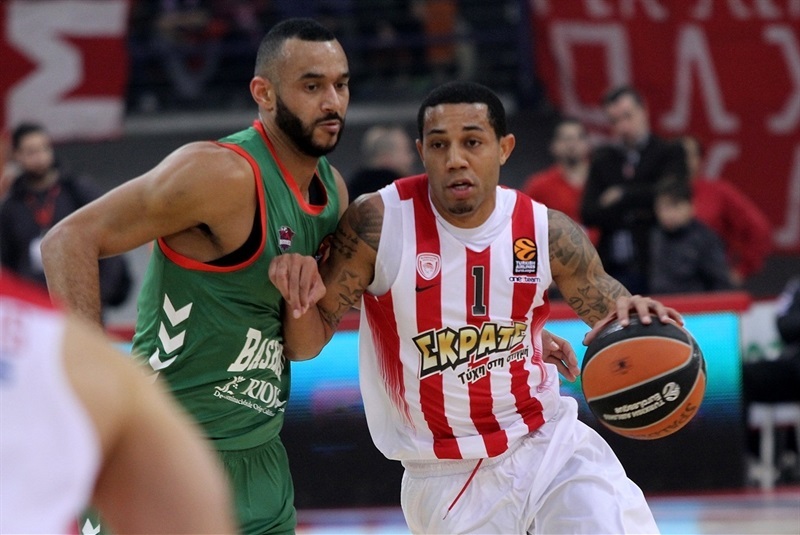 Six Olympiacos scored 5 points or more in the second half. Despite giving up 9 offensive rebounds, Olympiacos hit 17 of 26 two-point shots (65.4%) and held Baskonia to just 10 of its 30 shots inside the arc (33.3%) to get a mammoth 50-28 lead halftime. Nothing changed after the break as Olympiacos took off for a 33-point lead after three quarters and never looked back. Olympiacos ended up having eight players with at least 7 points, but none with more than 12 in a perfectly balanced offense. 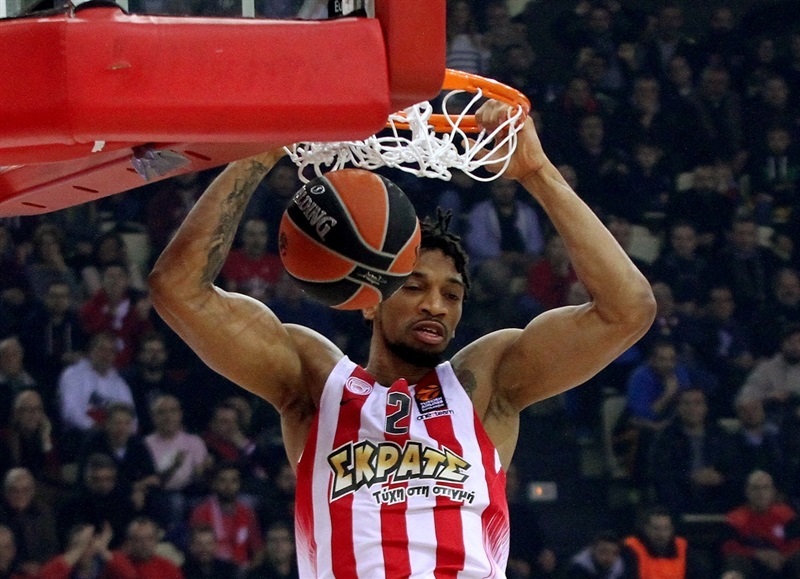 A driving basket by Mantzaris and free throws by Khem Birch gave Olympiacos an early 4-2 lead. Johannes Voigtmann dunked and got help from Kim Tillie and Chase Budinger to put Baskonia ahead 6-8. Tillie followed a driving layup with a three-pointer, but Spanoulis, Mantzaris and Printezis fueled a 9-0 run that gave Olympiacos a 20-13 lead. 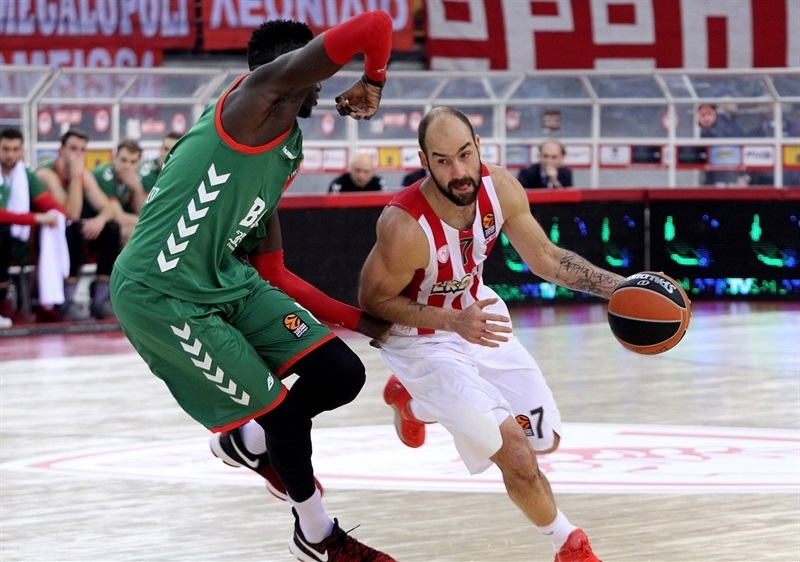 Free throws by Spanoulis and a dunk by Patric Young kept Olympiacos rolling at 24-17 after 10 minutes. Green buried a couple of jumpers on a 9-0 run, highlighted by Young's wild dunk-and-foul. Rodrigue Beaubois followed a three-pointer with a floater to bring Baskonia within 35-24. It didn't last long, however, as a layup by Green and a triple by Matt Lojeski started a 13-0 run, which Birch capped with a huge put-back slam that broke the game open at 48-24. Budinger and Hanga brought Baskonia a bit closer, 50-28, at halftime. Hanga and Beaubois tried to ignite Baskonia's comeback after the break, but a coast to coast layup by Papanikolaou and a big basket by Printezis in the low post made it 57-33. 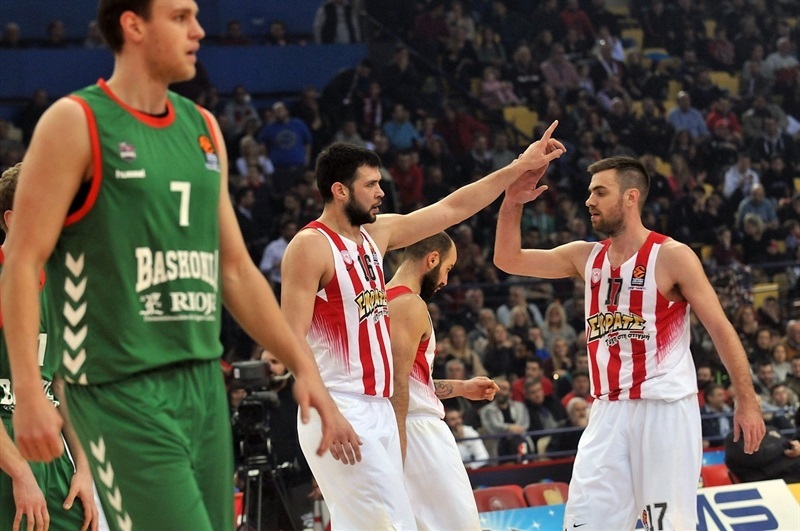 Papanikolaou hit a triple and Spanoulis added two more from downtown for a 68-39 advantage. 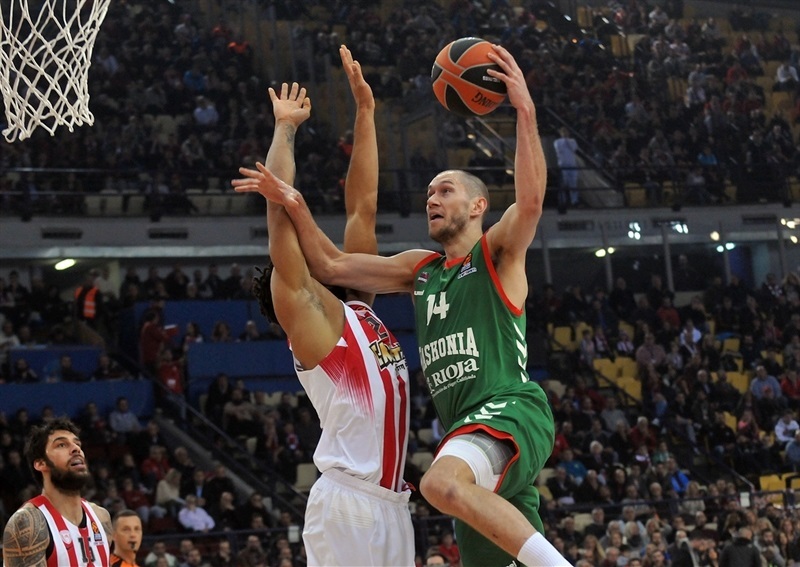 Baskonia kept struggling to score and an outstanding Papanikolaou gave the hosts a 76-43 margin after 30 minutes. Baskonia kept fighting once the outcome was clear and a put-back layup by Hanga prompted the hosts to call timeout at 76-48. 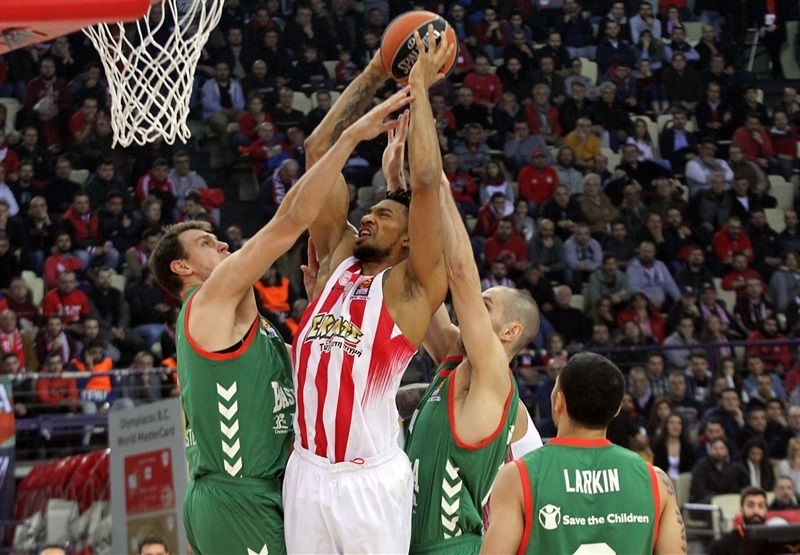 Olympiacos bounced back and a triple by Mantzaris ignited the crowd at 83-52. Baskonia did not give up, but the Olympiacos fans had plenty of time to celebrate an important win long before the final buzzer. "I want to congratulate our players because of the great game that we had tonight. It was a very important and crucial game for us and we showed great effort, performing as best as we could against a very good team. It was very important that, from the beginning, we put them under pressure with our good defense. In general, we controlled the game with our good defense, not only in the beginning, but also in the second half. We kept them to a very low score, 62 points. That was the key to win the game, because when play you good defense, you also have great motion on offense. I believe that the numbers also show the great offensive game that we had. It is the fact that everybody scored, each player and we had five players in double digits. It was one of our best games and for this, I want to congratulate our players. I also want to congratulate our fans. They had a big presence tonight in their support to the team. From now on, all games are very important and we want them to support the team until the end." 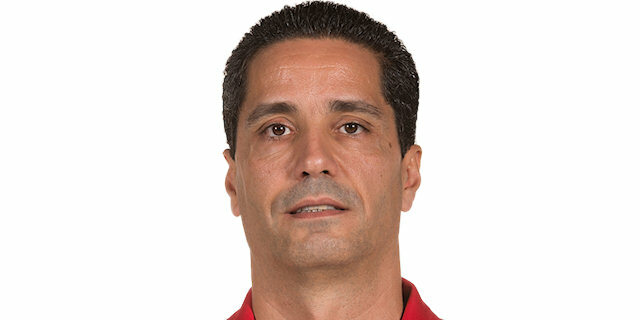 "First of all, congratulations to Olympiacos. Second, I have nothing to say about our game. We were terrible from the beginning. If we want to compete against these kinds of teams, first of all, we have to know the history this club has and after that, beat the character they show to get things done, and which they showed during its history. We have to improve, each one of us, and immediately get over this terrible game for us. I am talking about the attitude we need to have in a game in order to be competitive against any team. If we think we can compete only shooting and playing on offense, enjoying and playing like today, we are making a very important mistake because we will not be able to do the things we did in the first part of the season. We have to accept the result, but not the way we lost, in any case. You can play well or not, but if you play against a team like Olympiacos, you have to stick to your own basketball philosophy, know which team you belong to, have a clear mind and know what makes Baskonia different from other clubs. 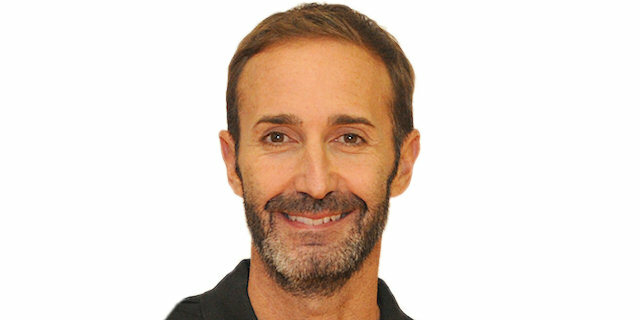 If you do, you cannot lose when it comes to energy, offensive rebounds, defensive balance and things that don't have to do with scoring the ball or not." "First of all, we wanted to react. We had a bad result for us on Monday here at home in the Greek Cup and we wanted to react from that. I think we did it the best way we could do it, starting from defense, as always. It was a very important game for us because we were playing against a team that is very close in the standings, so we wanted this win and everybody gave their maximum. They gave all they got and the final score, I think, gives a lot of smiles to our coaches and our fans about our reaction and the way we played the game. Everything starts by showing your opponent that you want it more than them, to fight for each ball, for each possession. We did everything great today, especially on defense. A lot of their key players were not able to play their game because of our good defense and that gave us the push to run in transition and get easy points."